Miami Dice Casino was first established in 2016 and is under the management of Caddell Limited NV Casinos. The casino offers an array of casino games to cater for its vast client base. The casino has been licensed by The United Kingdom Gambling Commission, The Malta Gaming Authority, and the Curacao Government. The casino has been in operation for over 3 years, and for this period it has always provided players with an amazing casino experience. The casino offers over 500 casino games across all casino platforms thanks to the likes of Microgaming and NetEnt gaming providers. Players get access to live chat, mobile, and email for customer support. 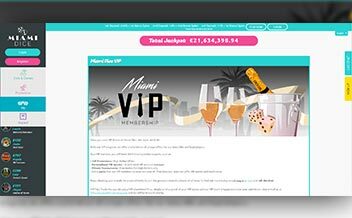 Miami Dice offers a lucrative welcome bonus to new players. The bonus is only activated when a player opens an account and makes a deposit. The bonus is offered for up to 200% for a deposit amount of up to £2500. The bonus is cashable and the wagering requirement is 35x, the minimum deposit amount is £20. Players who deposit through Neteller or Skrill are not eligible for this bonus. 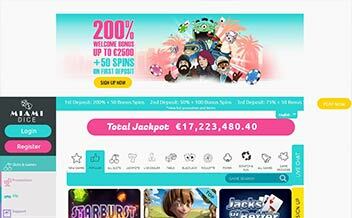 The casino also offers new players 50 free spins when they open an account at the casino. The free spins can be redeemed on Starburst Slot and the value of the spin is 0.1. The wagering requirement on these free spins 35x. 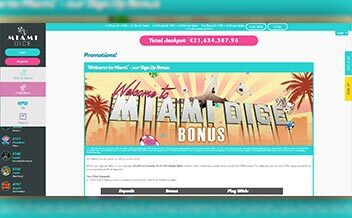 Miami Dice offers players a variety of slot games to cater for the vast client base. The slot games available have been designed in such a way that the whole experience is exciting because of the themes found in the games. They include famous games like Starburst, Crystals of Power, and Gonzo’s Quest among others. The casino offers different variations of classic table games which include Roulette, Baccarat, and Blackjack. These games have amazing graphics designs to enable players to have a wonderful experience. The live dealer section has been equipped with a good selection of live games. They include; Live Blackjack, Live Baccarat, and Live Roulette. The casino’s main software provider is Microgaming Company. The company has provided over 1000 casino games to ensure that the vast client base has been catered for. Other gaming providers include NetEnt, Leander Games, Blueprint Gaming and Nyx Interactive. Algeria, Austria, Afghanistan, Bulgaria, Bolivia, Denmark, France, Hungary, Iran, Iraq, Russia, Thailand, Spain, Virgin Islands, Panama and The United States among other, check out the casino’s website to see if your region is restricted. 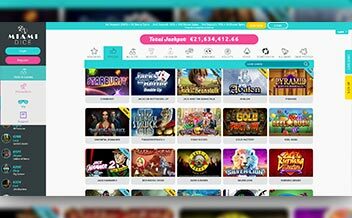 The casino has a user-friendly interface, players are able to access the casino games on mobile and tablet devices meaning you get to play the games anywhere anytime. The number of games on desktop version is more compared to the once on mobile devices. The casino supports web browsers like Chrome, Mozilla, Opera Mini and Internet Explorer. The casino has not received bad reviews over the years it has been in operation, however, the casino has been found to be in a deep financial crisis that may take them a long period of time to recover. Therefore, before joining this casino be sure that they have recovered from this financial crisis.